Ice crunched beneath my feet as I made my way down the river bank in the pre-dawn silence. The walk from camp to the bridge had made me thankful for the thick jacket now keeping me warm, but as I removed my gloves to operate the camera, a -12° breeze bit at my hands like thousands of tiny needles. It was cold…really cold. 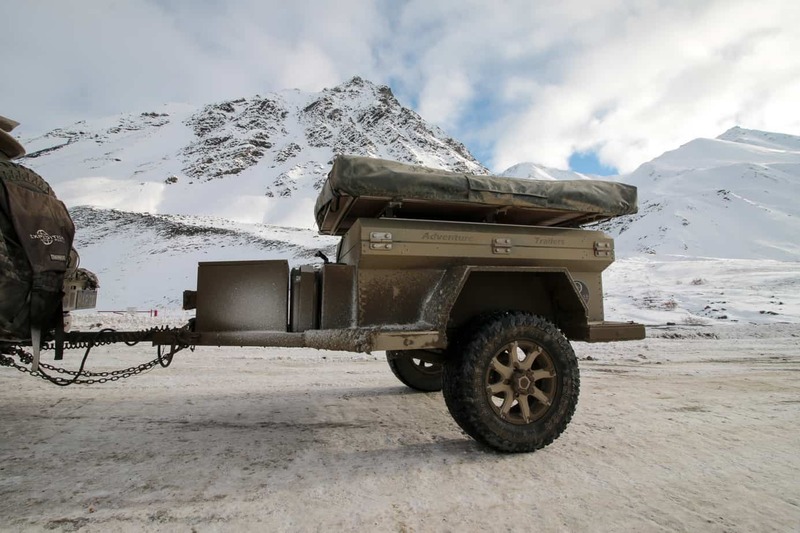 We were just inside the Arctic Circle, and as we waited for light to break over our temporary camp, I stared at the Flatbed Chaser, recalling the memories we’d made with it thus far. 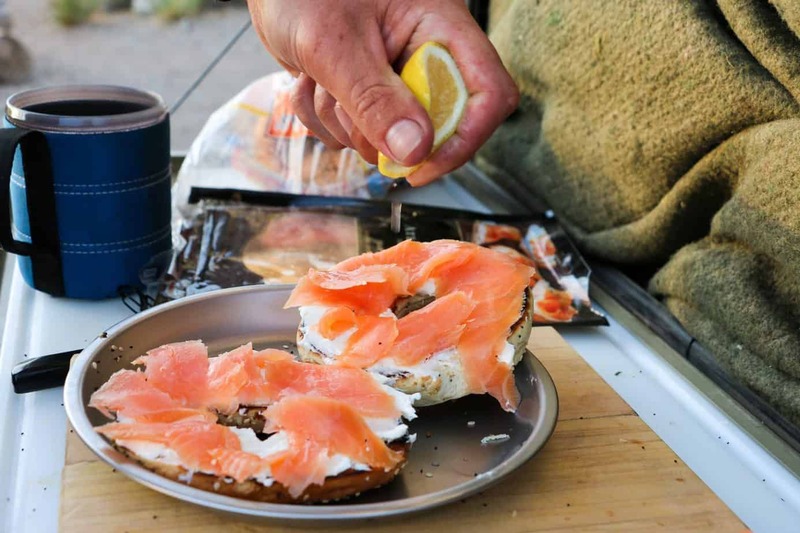 It had been almost a year since a hurricane had forced us to weather out days of rain in the tent, and even longer since we had camped in Big Bend and swam in the Rio Grande. Colorado’s continental divide had vanished in the blink of an eye, and now here we were, just a few hundred miles from the Arctic Ocean. Crisp morning light crested the peaks to my left interrupting my train of thought. I snapped a few pictures of the scenery now bathed in a white glow, and stuffed my burning red hands back into my gloves for the walk back. As my boots resumed their crunching march towards the trailer I couldn’t help but smile. We still had four weeks and thousands of miles left on our adventure. What new memories still lay ahead? In 2008 the Overland Journal and Expedition Portal team had the pleasure of bestowing our Editors Choice award on AT Overland’s first Chaser trailer. 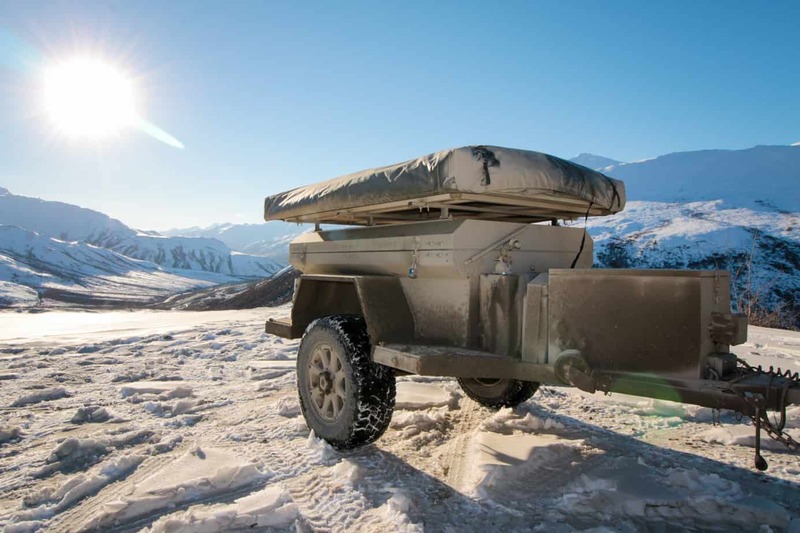 It featured their brand new Trailing Arm Air Suspension (TAAS) and was one of the few North American options equipped for true back country use, but much has changed in the last nine years. Buyers can now shop in a market packed with trailers of varying price, structure, and capability, with features ranging from basic to extravagant. Many have already proven their mettle in the field, and we’re forced to ask ourselves, does the Chaser still stack up? 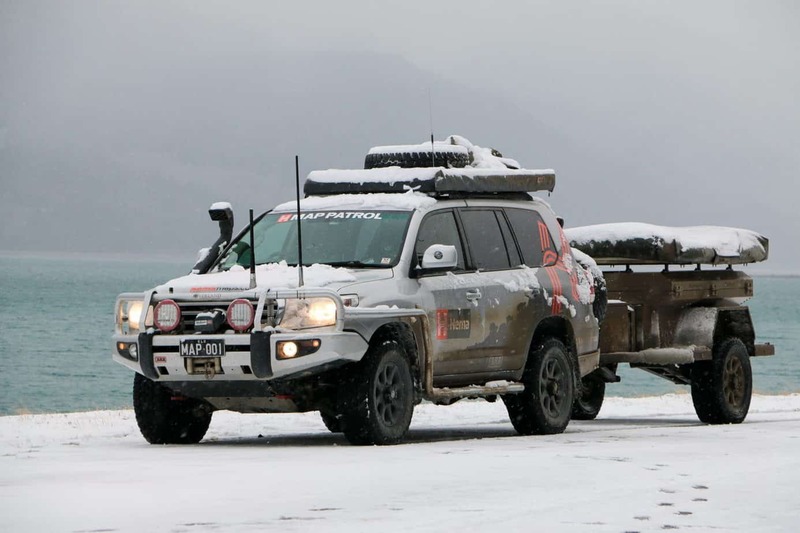 To find out, we grabbed their new flatbed concept and set out for one of our most ambitious tests yet; a ten thousand mile journey through desert sands, Arctic snows, dense forests, and torrential rains. 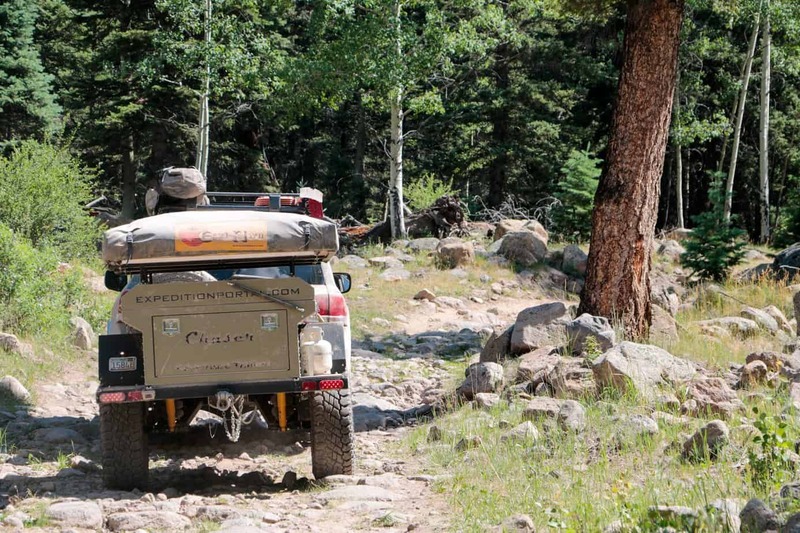 The trails were often tough, the days were always long, and over the course of four dirt covered, sun-baked, and rain-soaked months, we came to know this trailer as more than just a product, but as our home. A product often reflects the experiences of the people designing it, and the Chaser is no exception. 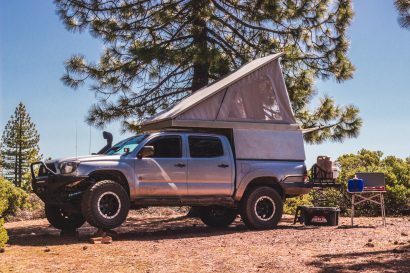 The AT Overland team has learned through years of hard work that the simple solutions are often the best ones, and that has helped them create one of the most reliable trailers around. 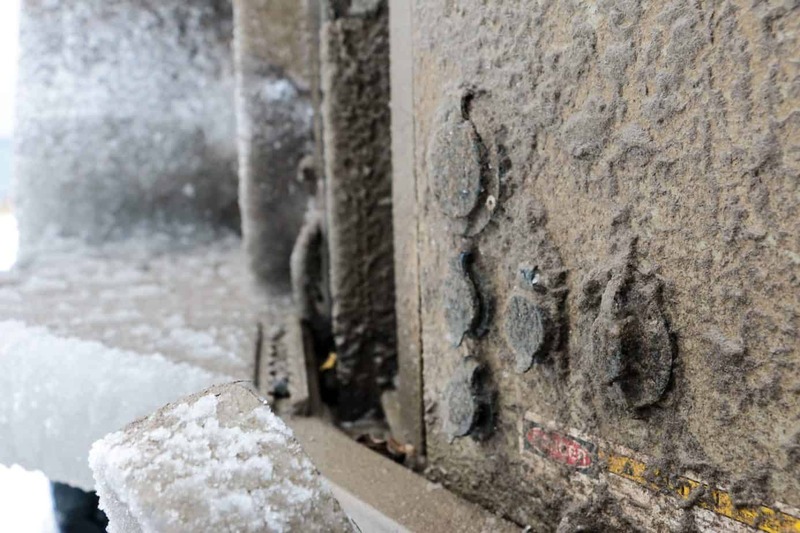 Despite temperatures ranging from 100° to -20°, and thousands of miles of mud and corrugations, we only experienced one system failure, and even that was repaired in the field. So let’s take a look at the features of this rugged camper, and see what worked and what didn’t. 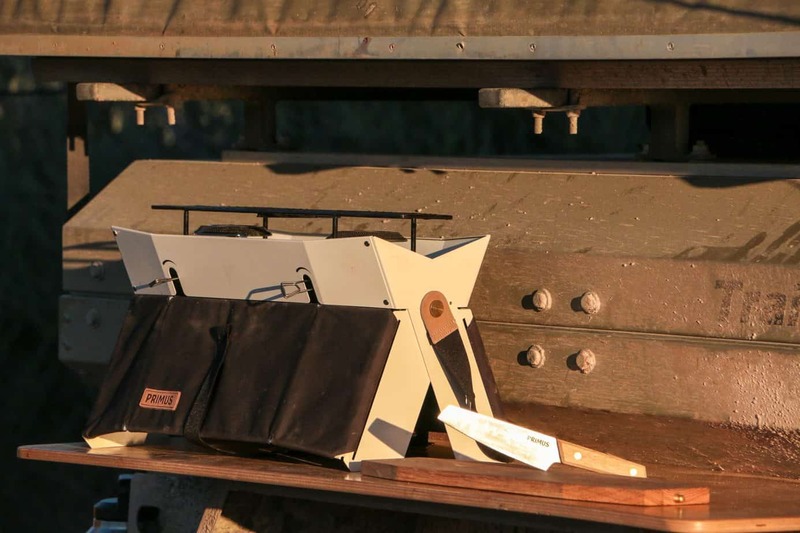 The Chaser platform is now available with a range of cooking options including a “Stand Alone Kitchen”, slide out stove, cutting board, hot water, and storage trays, but we chose to stick with the basics. 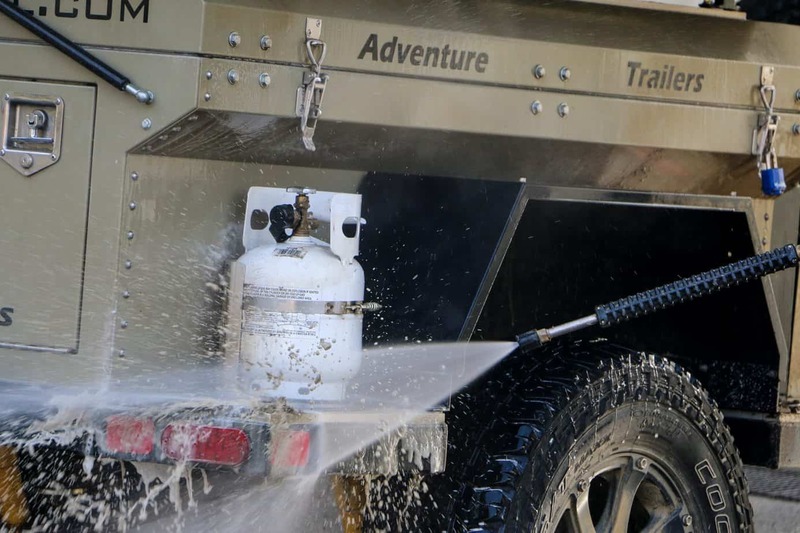 On the rear passenger quarter panel, a 5-lb propane tank was mounted for use with a stove or propex heater. Since we were regularly encountering freezing temperatures, we opted for the latter, and used a Primus stove for cooking instead. Our second option was a Baltic birch shelf, which can be wedged over the fender to make an excellent table or prep surface. I’ll be honest and say that this design impressed me far more than it should have. Instead of developing some complex and expensive accessory, they cut a piece of wood to size and added two metal tabs to the fender to keep it seated in place. It’s simple, it’s effective, and I love it. Initially we stored this table down the inner wall of the trailer, however, we soon discovered it could lay across the tub in the rear to form a shelf for supplies. This made accessing items on the bottom level through the tailgate much easier, as it prevented the top layer of equipment from collapsing. The third option was a custom cutting board designed to recess into the tailgate for easy storage and access. It’s made from a high density polyethylene, and held in place with Velcro to make removal easy. Unfortunately my sausage fingers struggled to remove the rounded edges from the tight space, and at 6’4″ tall I was forced to bend if cutting on the tailgate. The combination led me to shy away from using it, but for people of a normal size, I could see it making a lot of sense. If you plan to spend time in the back country, it is critical to carry a sufficient water supply to prevent dehydration. Jerry cans and other containers will get the job done if necessary, but I find that the more difficult it is to remove or open a container, the less you tend to use it. That’s why AT’s 19 gallon tank should be considered a mandatory upgrade for anyone considering this trailer. 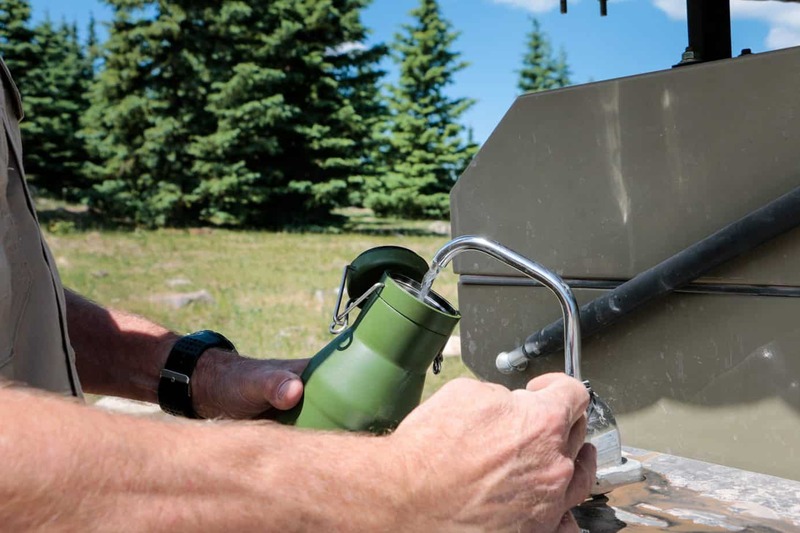 The mechanical pump mounted to the top makes it easy to fill your bottle each time you stop or walk by the trailer, and the BPA free, food grade plastic leaves no strange tastes or chemicals in the water. The mechanical pump was the single aforementioned breakdown of our trip, but it was due to some dirty water and my failure to clear it during freezing temperatures. Even so, AT was able to ship a replacement out immediately, and we made a quick swap with basic hand tools to get us back in service. 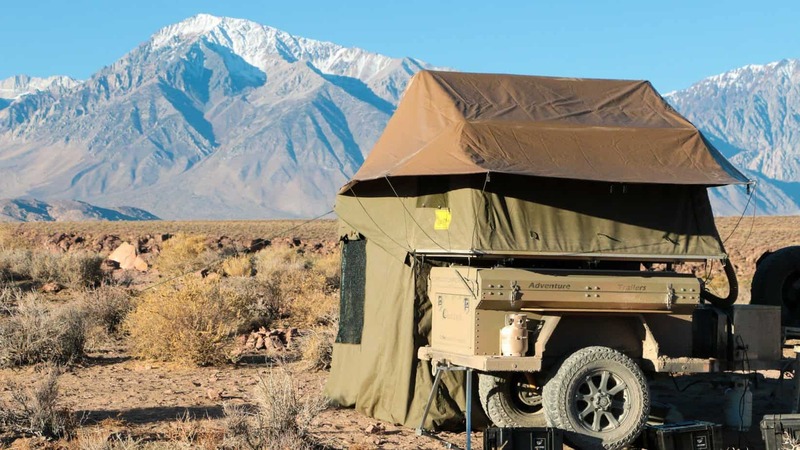 A good nights rest can make the difference between an enjoyable trip and a total disaster, so adequate sleeping accommodations is a vital consideration. 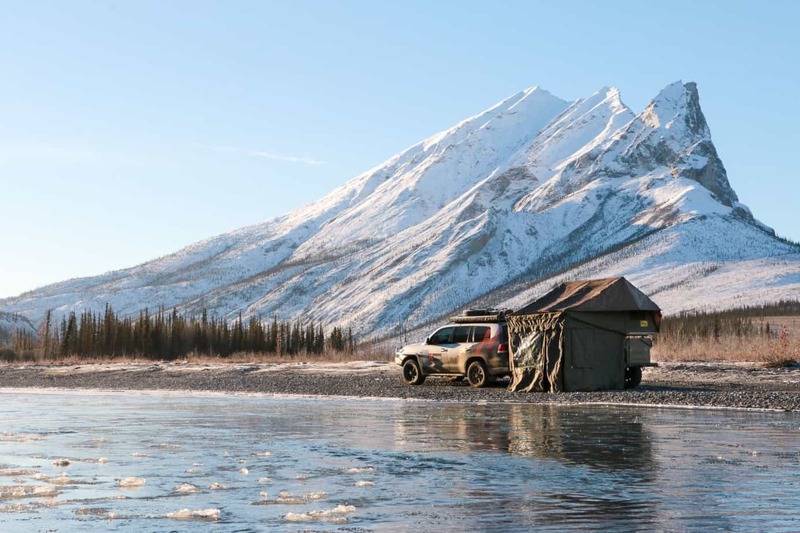 The chaser can be equipped to fit just about anyones’ tenting tastes including hard shells, soft shells, and even huge luxury options like the Eezi-Awn Globetracker shown below. This trailer-specific tent design is made from 260 gram poly-cotton, rip-stop fabric coated with Teflon, and features a rather plush 3.4″ thick queen size mattress. When erected, it spans nearly seven feet by twelve and a half feet, and includes an enclosed 470 square foot room with a 6’4″ entrance. This gave us plenty of space to set up a table and chairs for work, spread out bags for changing, and even lay down yoga mats for an evening stretch. It was shocking how much room we really had, and with the Propex heater cranked up, we could kick back in shorts and a t-shirt in the middle of a snowstorm. 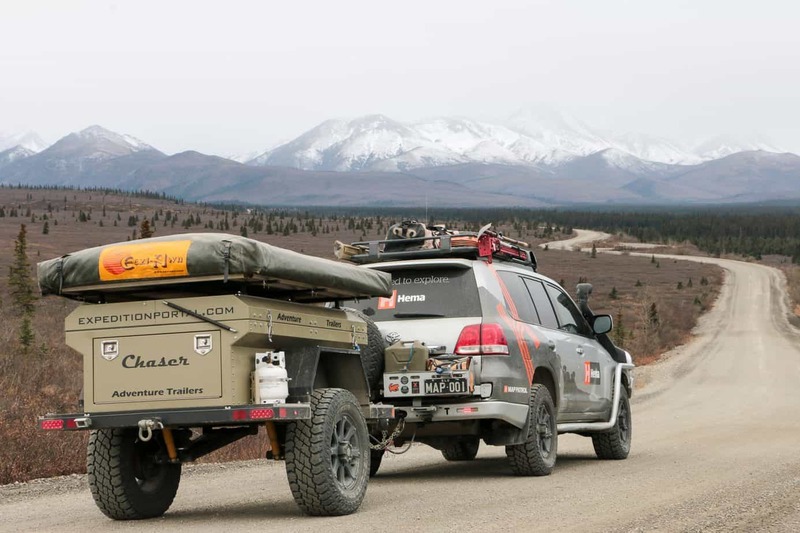 Despite its size, the Globetracker was a breeze to deploy and stow thanks to its permanently fixed mattress. 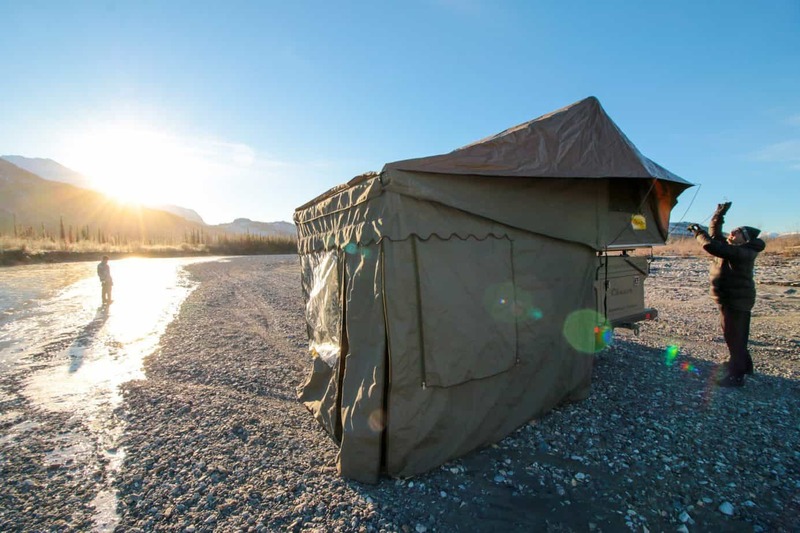 Unlike traditional tents which require you to fold the heavy floor in half, users only need to lift up and extend the fabric walls, greatly reducing the force required for setup. The lack of a folding floor also gives the tent a much lower profile when stowed, therefore improving fuel economy. The downside is that the footprint is quite a bit larger than that of a standard tent, but on the Chaser platform it really makes no difference. Our flatbed chaser came decked out with a range of fun electronic toys, the core of which was a Deep Cycle battery, a voltage monitor, and an inverter. 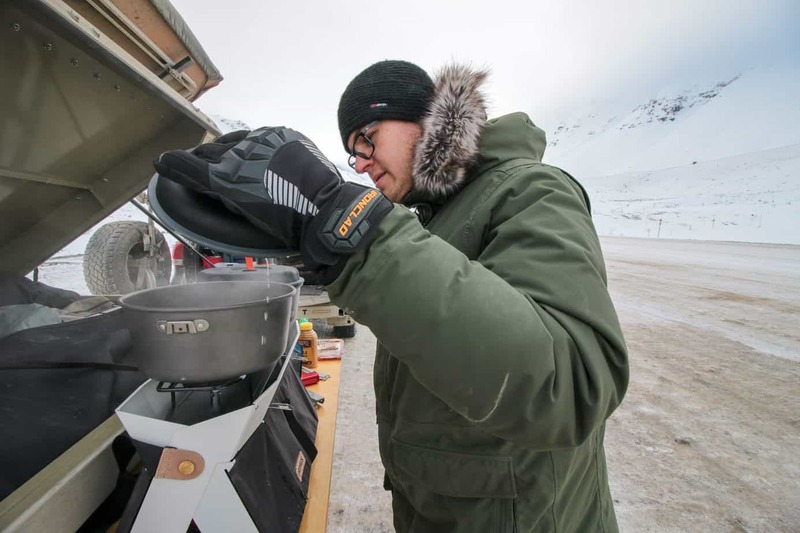 A solar charger and controller were also added to provide a secondary power source in the field, and several USB and 12v sockets were installed to charge devices like tablets and the Propex heater. 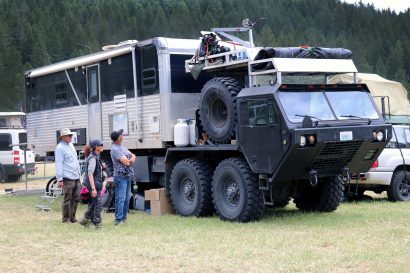 The only feature missing, which I believe is a must, was an extension cord of some kind in the trailer’s nose box. This would have allowed us to run power to the tent more easily, instead of barely reaching the USB ports with our phone cables at night. 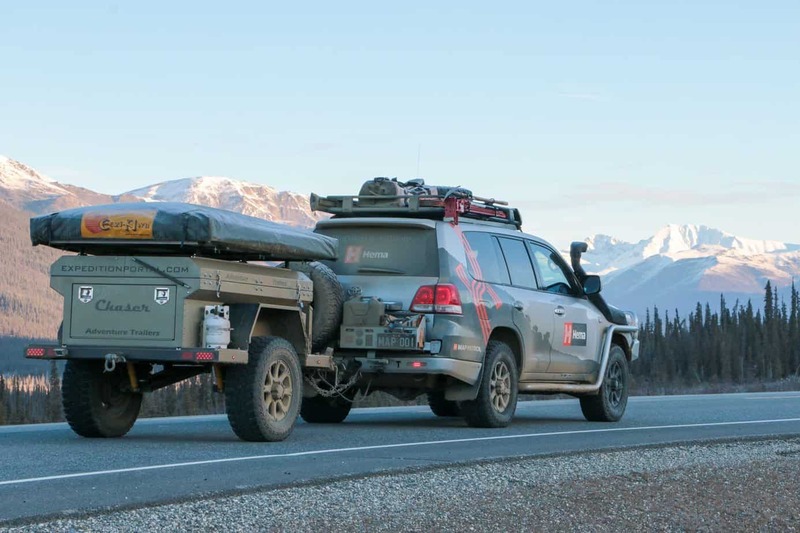 Whether you plan to use a Chaser to get out of town quickly for the weekend, or intend to load it up for a trip around the world, its core purpose is to transport your gear safely and securely to a destination. Every trailer design seems to have a unique way of doing this, but the Flatbed Chaser may be the most versatile. In its traditional form the tub provides 72″ of length, 40″ of width, and 26.25″ of height in which to store boxes, bags, and parts. 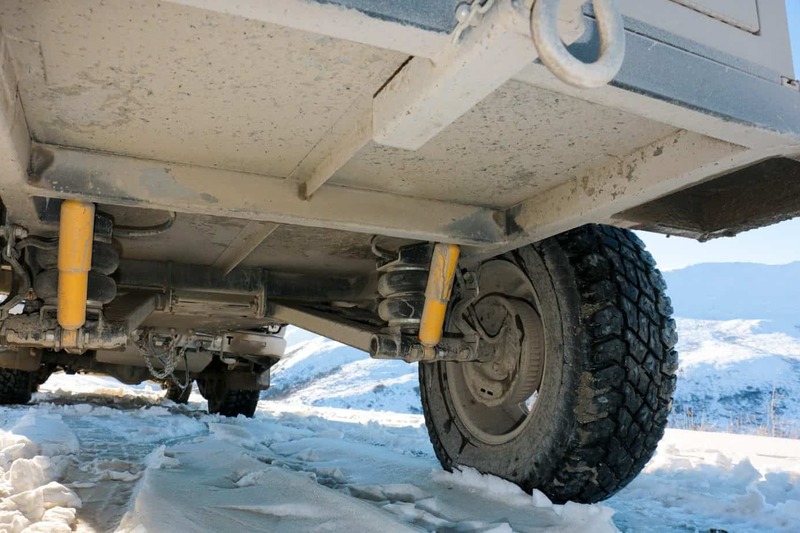 A series of tie-downs are bolted to the floor to make securing the load easier, and a rubber mat prevents equipment from shifting or chaffing. This simple method of organization gives the greatest number of storage possibilities, and is ideal for those travelers who are constantly changing their payload. 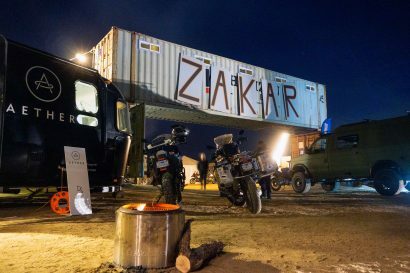 The only downside was a lack of organizers or dividers to separate gear, as constantly sifting through boxes and bags became old after months on the road. Despite weeks of rain and hundreds of miles of dirt, the Chaser’s seals remained strong, and prevented any dust from entering the tub. Each time we opened the lid, our gear was ready to go, as clean and dry as the moment we had put it away. 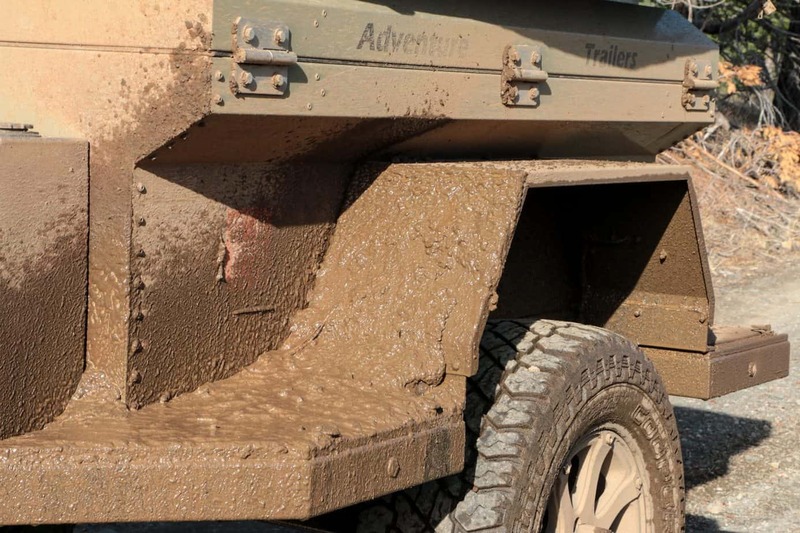 The tongue box, however, did manage to take in some silt in the Mojave, as rocks being flung up off the Land Cruisers’ tires cracked one of the sealed plastic pass throughs. Ordinarily I wouldn’t mention a flaw due to trail damage, however, the Chaser seems to be particularly prone to chips and cracks of this type. The powder coat also took a beating from hundreds of rock hits, resulting in plenty of small marks and scrapes. 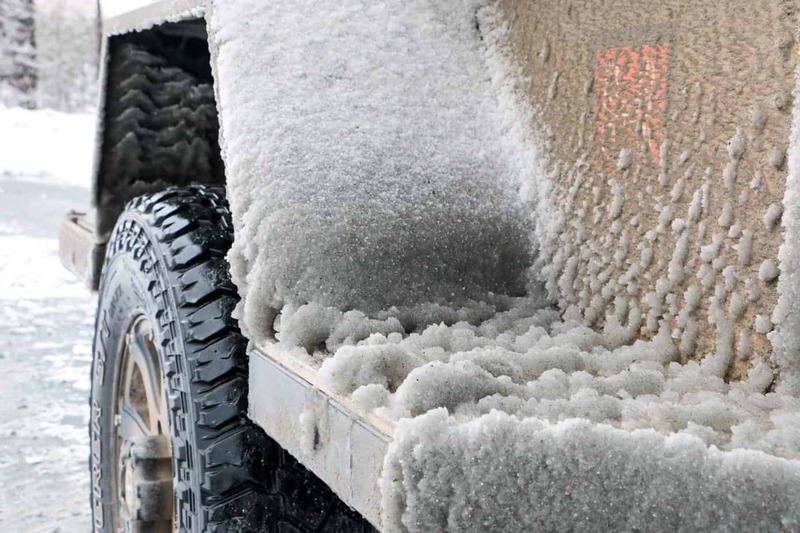 A stone guard of some sort, like those used in Australia, would be a wise investment for longer trips, and it would assist in minimizing the mud build up repeatedly experienced on the front of the fenders. In truth, the internal storage space of the standard Chaser is nothing special in today’s market, but the optional Flatbed gives it a unique edge over competitors. The switch from cargo box to a flatbed is surprisingly easy to do, and only requires some time with an impact wrench to remove the bolts securing the tub to the frame. We recommend using a pulley system or several friends to lift it free of the trailer, but two people could do it if the tent is already detached. Once the tub is removed, a bed-lined floor is revealed with multiple rows of aircraft track for tying down payloads of various sizes and weights. Motorcycles, quads, construction supplies and more can be towed wherever your truck will go. Afterwards, attach the tub and head out for a relaxing camping trip in the woods. The Chaser platform has always been known for its off-road prowess, and the flatbed variant is no exception. It shares many of the traits which made the original model famous, but with a few key updates that improve handling, ride quality, and technical trail performance. Chief among them: the fourth generation suspension. It is based on the original TAAS system, but it now utilizes a taller airbag, more aggressive shock angles, and a set of limit straps which control a larger range of travel. The result is a smoother and more predictable towing experience than ever before. On long corrugated roads with potholes and embedded rocks, I found that the Chaser remained firmly planted and lacked the wandering tendencies commonly seen in competitors at higher speeds. Abrupt ruts and unexpected dips failed to unsettle the suspension, and the extended range of travel combined with the damping from the shocks greatly reduced harsh impacts while eliminating the bouncing I had come to expect. Additionally because the a-arms work independently to absorb impacts, a quick compression on one side did not transmit as much force to the opposing side, therefore reducing the total sway. Of course this all stems from the true beauty of the original design, which is its ability to adjust the spring rate to match a payload. Unlike a traditional leaf or torsion suspension which is rated to perform at a single weight capacity, the airbags in the TAAS system can be inflated or deflated on the go. This eliminates the all too common issues of a harsh ride from under-loading, or sagging and unstable springs from overloading. 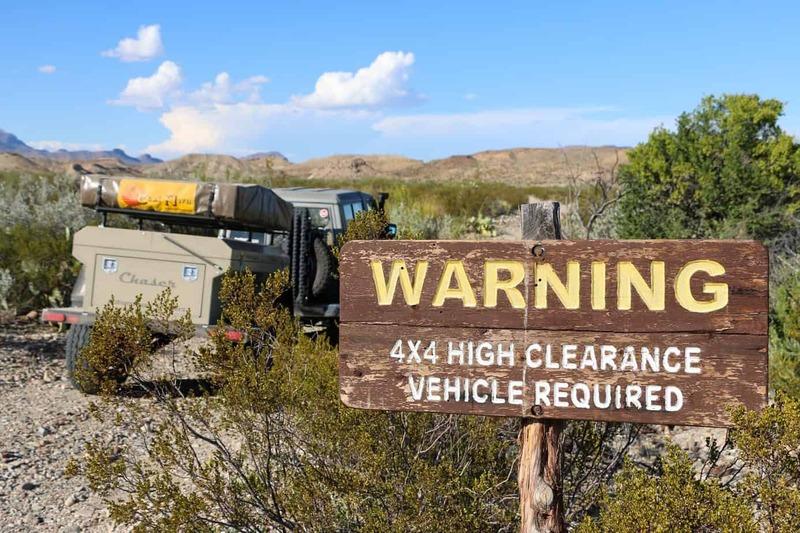 This feature is even more crucial with the flatbed variant we tested, as the max capacity of 2700 lbs can be quickly reduced to an empty weight of less than 700 lbs by removing motorcycles, quads, or other equipment on the trail. 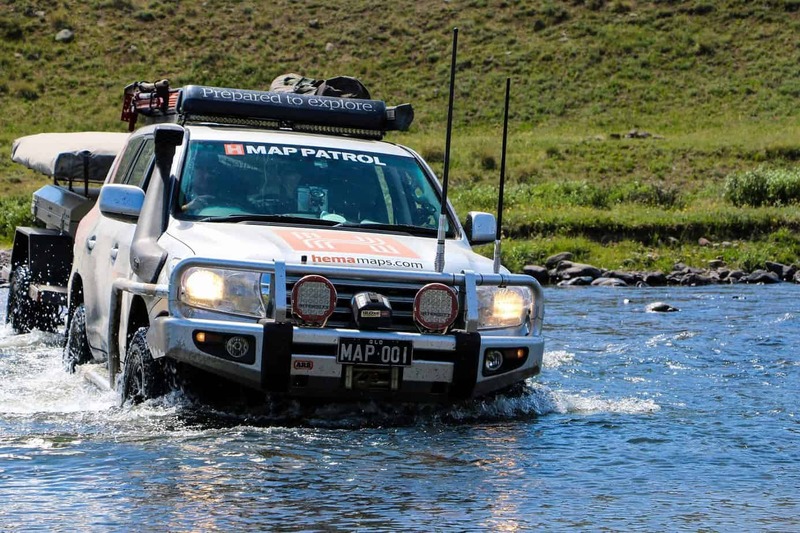 In technical terrain the improved ground clearance made the Chaser even more capable than the original, which is saying something given that the first generation could run the Rubicon. 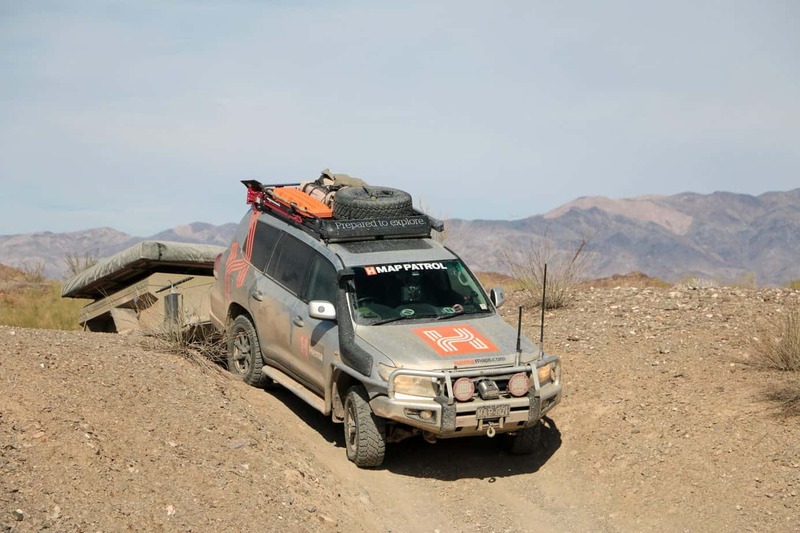 When mounted on 35″ tires with a properly inflated suspension, ground clearance comes in at 24″, which easily passed over large rocks and cleared the most aggressive break over angles encountered during our trip. It also kept the frame and body out of the water on river crossings, which greatly reduced the risk of being swept down stream or rolling over in the current. The CG (Center of Gravity) seems to have remained low despite the additional lift, and I was pleasantly surprised to find good stability even in off-camber situations. After hauling our exceptionally wide So-Cal Teardrop around for two years, I had expected to immediately fall in love with the Chaser’s size, but in the end it proved to be both a blessing and a curse. In tight spaces like the dense forests of Oregon or California’s box canyons, the small dimensions and short draw bar length repeatedly allowed us to thread the needle between obstacles where larger models would have certainly been stuck. The lighter weight made towing on steep grades and soft surfaces a breeze, and on more than one occasion it rolled right past a rock or tree that I had expected to cause trouble. It is without a doubt one of the most maneuverable trailers I’ve had the pleasure of testing, however, some of the same traits which make it great often made life difficult. The short draw bar made the Chaser more touchy than I would have liked when backing up, and in snow or sand it was particularly frustrating. That problem was compounded by the fact that the trailer was too narrow to be seen easily in our mirrors at all times, which often forced the driver to back up in a series of side-to-side corrections as the Chaser veered in and out of visibility. AT Overland can fix that issue by widening the track width to match the vehicle, but the tendency to dart back and forth is the cost it pays for maneuverability. While I’d like to say that every journey we make is on dirt, the majority of driving between trips lands us on pavement, which makes road handling an equally important consideration for purchase. Unfortunately, there was little to report here, so I’ll be brief. Over the course of 2000 miles, the Chaser usually disappeared behind the Land Cruiser and rolled along without the slightest feedback. With its low weight and mild manners we almost forgot it was there on several occasions, but were quickly reminded by the thumbs ups of passersby. At 75 mph the trailer tracked straight, and even in high winds did not begin to sway or jerk the vehicle. 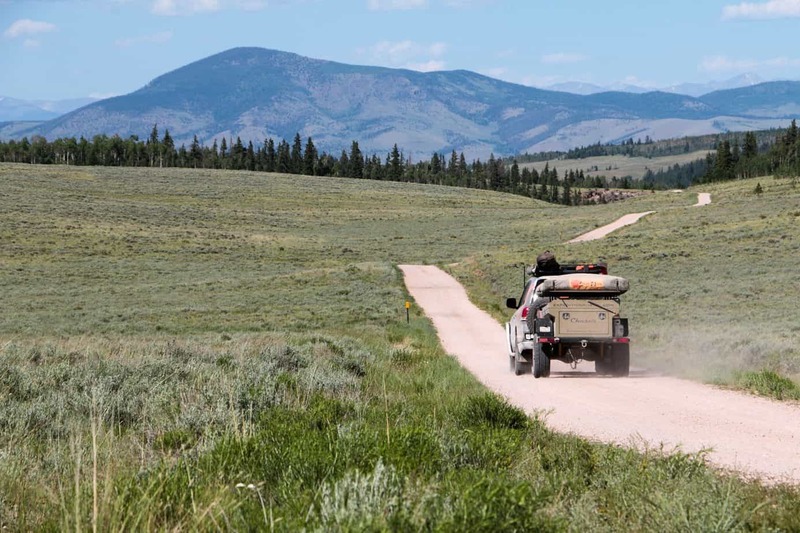 Tight turns and bends in the mountains posed no issue, and the vehicle and trailer maintained their composure during emergency braking and swerving maneuvers. In the end the only complaint I could find with this trailer on pavement was that we hadn’t reached the dirt. 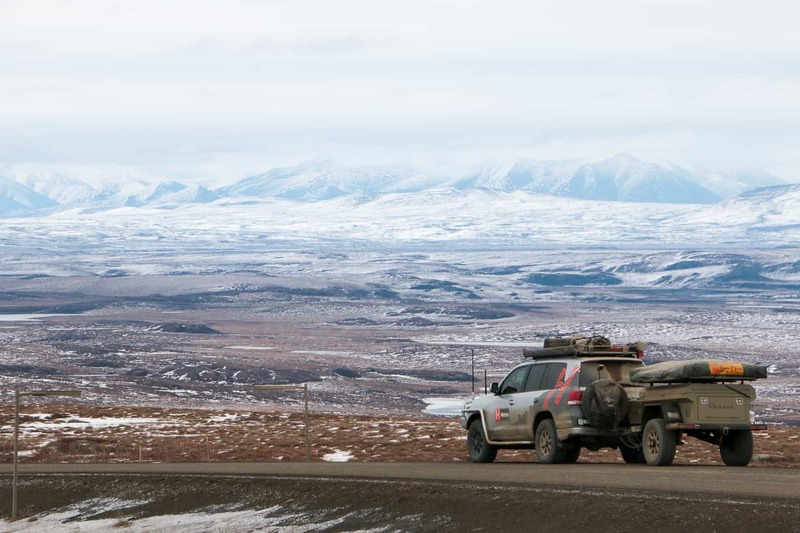 After months of traveling back roads from North Carolina to Alaska’s Northern Slope, I can say with confidence that today’s Chaser still makes the grade. 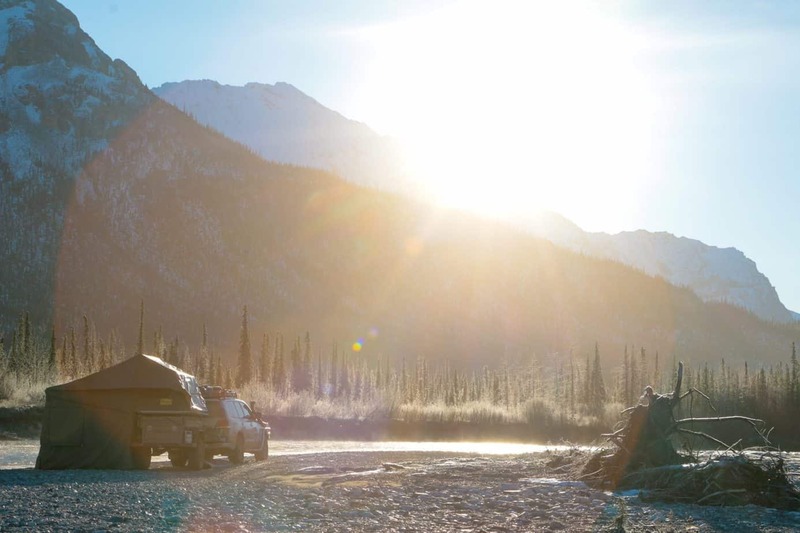 It continues to deliver the immense capability and luxurious camping features that made the original famous, but now includes more functionality and utility than ever before. 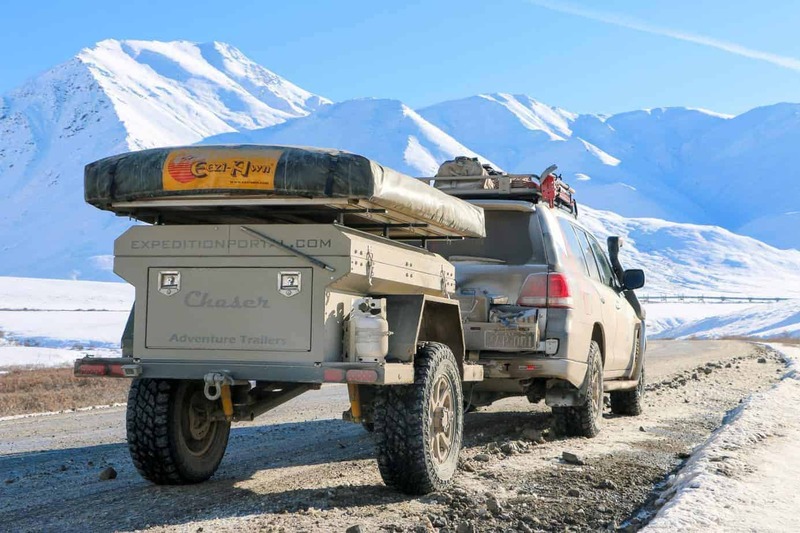 Whether you want to haul kayaks to the lake, take your dirt bikes to the track, or set off on an around-the-world expedition, the Flatbed Chaser can answer the call. Just hook it up, and head for adventure.